Today, one of the largest fiat-crypto exchanges BitBay announced its collaboration with Coinfirm, a leading provider of anti-money laundering (AML) and risk assessment solutions and services for blockchain and cryptocurrencies, solidifying it’s approach towards the professionalization of the crypto industry. BitBay looks for innovative partnerships all around the world to grow the crypto ecosystem and bring our business to the next level. Coinfirm offers solutions that increase the trust in cryptocurrency and facilitate their adoption on a large scale.- says Patryk Kadlec, VP, Chief of Business Development at BitBay. Created by former global heads of AML at major financial institutions and cryptocurrency veterans, Coinfirm’s AML Platform has placed them as a worldwide leader in RegTech for blockchain. The Platform is already servicing clients ranging from exchanges, major crypto entities like Dash, over 100 ICOs, to major banks and financial institutions around the world. Coinfirm AML Platform, the AMLT Network and token create a system that further helping protect users and increase the adoption of cryptocurrencies as a whole. 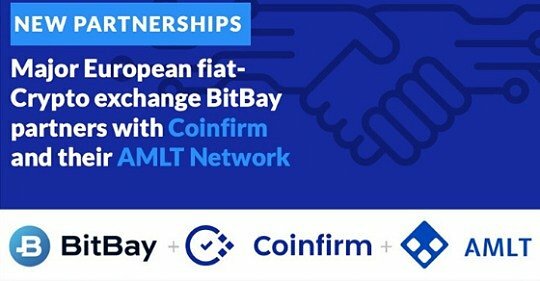 Coinfirm’s recently launched AMLT Network has not only given a voice to the cryptocurrency economy but along with the Coinfirm AML Platform has given it a tool to limit potential damage caused by fraud and nefarious actors while limiting their incentives to do such actions in the first place. Now when a hack happens and is reported quickly into the AMLT Network, there is the possibility that it could prevent the funds and actions from spreading further risk throughout the economy. With the growing participation of other industry leaders like BitBay, we can bring a new level of transparency, security, and therefore adoption to the cryptocurrency and blockchain space. We are more than happy that BitBay, which represents the quality and scale not only wants to be a progressive industry player in compliance in collaboration with our technology but help us push mass adoption of cryptocurrencies globally – explains Grant Blaisdell, Co-Founder at Coinfirm. Coinfirm’s AMLT Network is a forward-looking project. We are glad that we will contribute to its development.- concluded Patryk Kadlec. BitBay is the third largest cryptocurrency exchange in Europe. The platform was founded in 2014 in Poland. Its market share in the home country is around 70%. From the very beginning, BitBay has focused on international expansion. Today it has nearly 1 million users worldwide and employs more than 100 people. The exchange lists over 20 cryptocurrencies and allows for fiat deposits and withdrawals in USD, Euro, and Polish Zloty. Following the rapidly growing cryptocurrency community, BitBay is developing and expanding its offer with unique and original products such as an internal fiat exchange, the PRO mode for advanced traders, crypto payment gateway BitBayPay, and professional ICO services. In 2018, BitBay was awarded the Best Cryptocurrency Exchange during Cryptocurrency World Expo – Berlin Summit.